Activity log and How can I see who has done what, and avoid overwriting their edits? The activity log will tells you who has done what, when. Everything that is done is registered, we keep a full audit trail. You can access it by clicking the people-icon on the top right of the guideline, next to the settings buttons and search. When other authors make edits, you see an indication on that icon, how many edits are done. You see this in realtime when editing, so you know if there are other authors that are active at the same time. If other users have been doing edits while you have been away from the guideline, you see an indication of amounts of edits done since you last accessed. In the activity log you can 'undo' deletes, you can filter, search and navigate for edits by filtering by users or type of change. 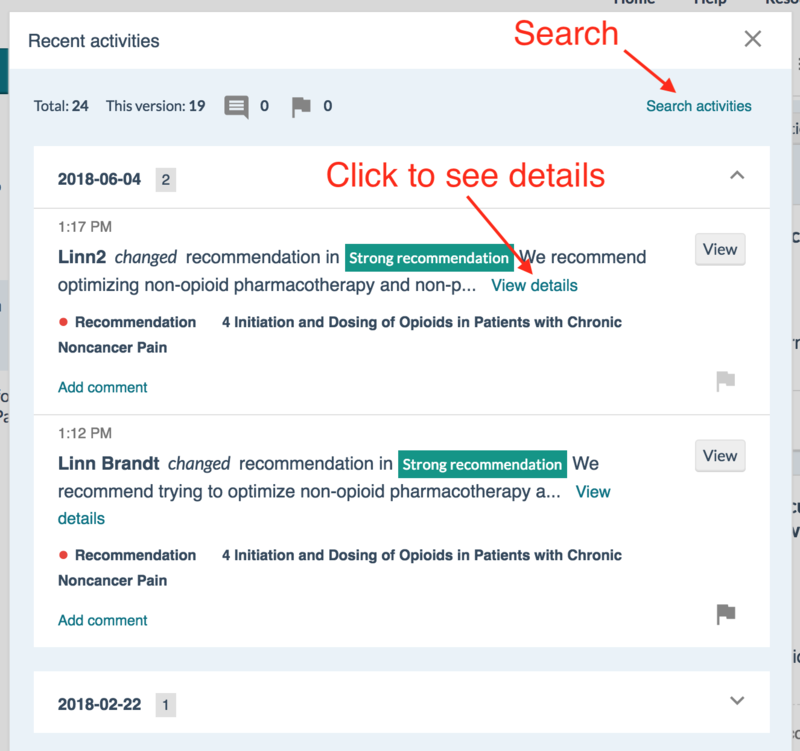 Use the search field to search for any phrase or person, or simply click on the item you want to filter by (e.g a specific recommendation or the rationale in a specific recommendation). You can flag specific edits, or write comments for follow up. You can filter by all edits that have a flag, or a comment, to easily keep track of things to follow up. If you would like to create specific tags for follow up, use hashtag and create a label in the comment, like #AdamReviewLater. You can now search for this label, and all edits where this is placed in the comment will come up. 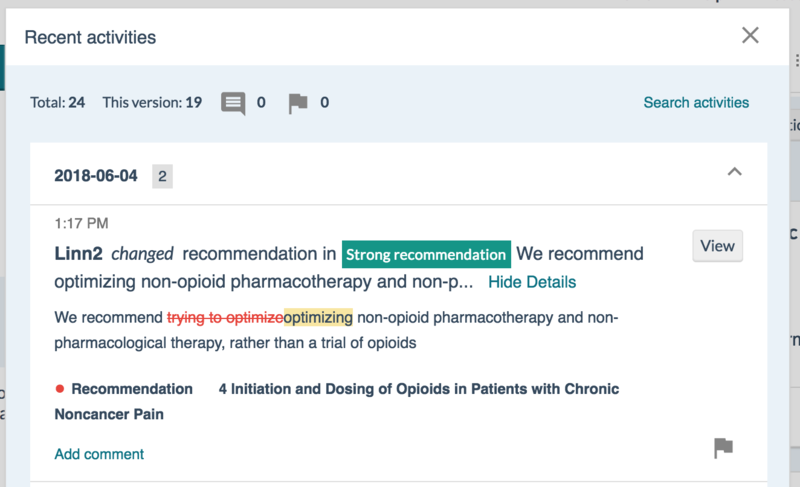 When you are in the draft of a guideline and other authors are working, you can see by the enteries in the activity log that they are making edits. But you can also see directly in the interface if an author has opened up a text for editing. 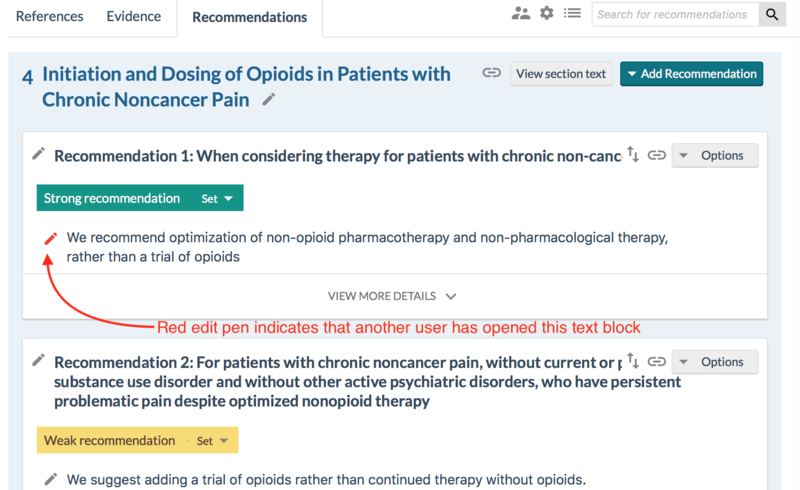 You will see a red pen, instead of the normal gray one, on text boxes and items that are currently being edited by other authors. If you hover over with your mouse pointer, you see which author is editing and when they started. 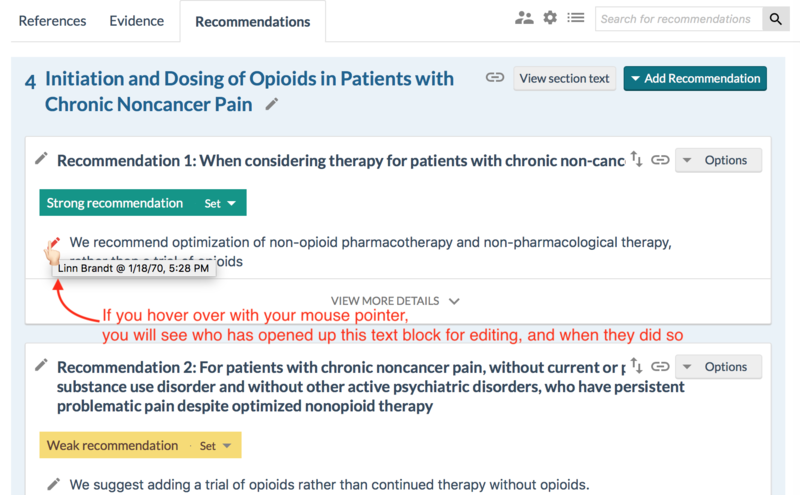 With this feature authors can more easily be able to avoid overwrite each others edits. How do I make a new Guideline or Evidence summary? How do build the table of contents: add, edit titles, move, reorder and delete sections? How do I make and navigate subsections? How do I add a Reference, PICO question or a Recommendation to a section? How do I add general text under a section? How do I use track changes? How I create a word document of my guideline? How do I delete guidelines?